Creating a Free Photography Website on Dropbox Cloud is not difficult if you follow our easy step by step guide and use some free softwares. Actually there are lot of options. But we will tell you the way, which is easiest but will look very professional. There are reasons for creating a Photoblog or Photography website of your own. We basically wrote the reasons as a separate article, if you want you can do a search in this website using the search function. We will not link because it s possibly distracting to read this technical guide after reading the normal article. This is ours and you can see, the Carousel is not at all bad. You, actually can use any HTML website template for this purpose. Any literally broadens your scope. Now for the Editing software part, Coda is possibly the best tool for the work at that cost – you can Edit the HTML and visually see the thing, unfortunately it is for Apple OS X only and is paid. If you even want a kind of backend, there are Admin panel available, although most are paid. If you do a search in Google Web Search, you will find lot of Free Bootstrap designs. Actually you need to create one template only for the newer images. Other webpages will be static. Yes, you have to manually work a bit more, but what one can expect from a fully free setup with all the most wanted features now – HTML5, Responsive. We hope you got some enthusiasm for creating a Free Photography Website on Dropbox Cloud after reading this guide, obviously we will provide more helpful ready-made things in future – obviously for free. This Article Has Been Shared 1334 Times! Great idea. I’d never really heard of dropbox until just recently but a couple of my friends use it to store images and are pretty happy with it so I’m going to check it out. 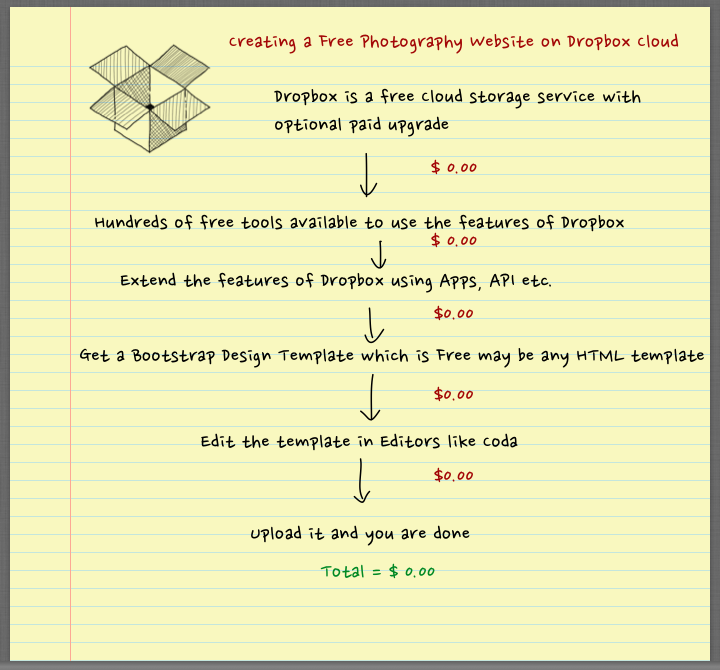 Cite this article as: Abhishek Ghosh, "Creating a Free Photography Website on Dropbox Cloud," in The Customize Windows, July 23, 2013, April 25, 2019, https://thecustomizewindows.com/2013/07/creating-a-free-photography-website-on-dropbox-cloud/.